Cake by Debbie Skelton, Photos by Steve Shanahan. 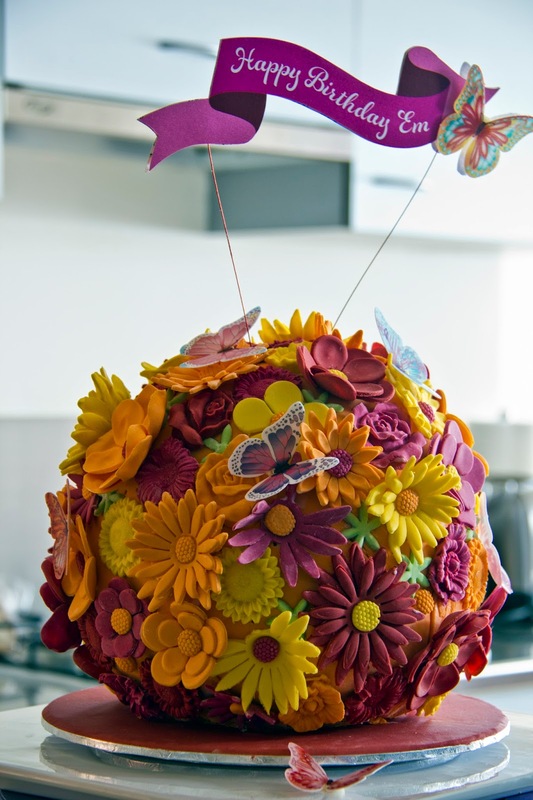 Cake topper by Rebecca Yit from Urban Weddings Brisbane. The design of this cake is based around the concept of the Victorian Kissing Ball. In the Victorian era, when it was usual to only bathe infrequently, flowers were pierced into pieces of round fruit to mask the strong body odours of the great unwashed. The flower covered ball of fruit would then be placed around the house. Over the years, the floral ball custom then morphed into a traditional Christmas decoration and later was also endowed with notions of romance. This Kissing Ball cake is a lemon and coconut madeira cake for the top half and an orange madeira on the bottom half, torted with home made lemon curd, covered with white chocolate and coconut ganache and covered with orange fondant and a 50/50 mixture of fondant and gumpaste flowers in orange, red, pink and yellow. 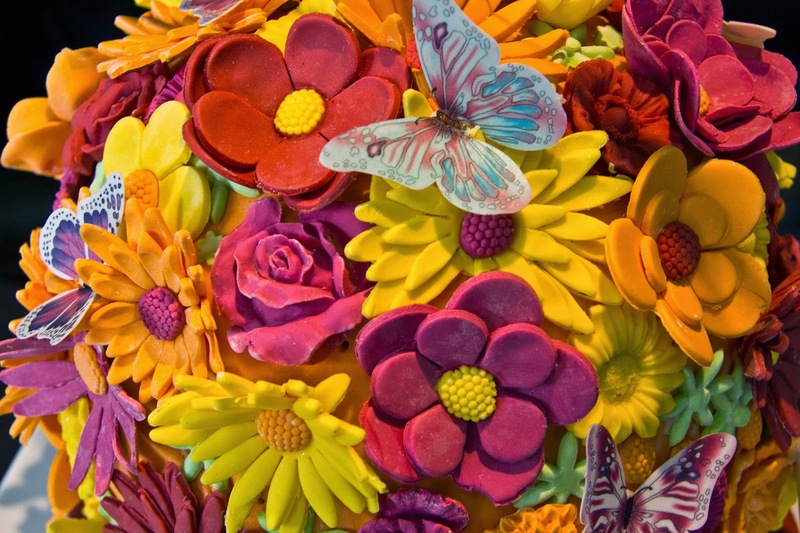 The flowers are daisies, pansies, peonies and sunflowers and rice paper butterflies. The cake tin was a Wilton half sphere and was baked in two halves. The inspiration for this design came from Lindy Smith. First published Canberra Times 2 July 2014. As a nod to the good ol’ stars and stripes Fourth of July celebrations, it seems fitting to celebrate the day with a yanky doodle nosh up. In the States, backyard barbies and shared food with family and friends accompanied by the patriotic glitter of red, white and blue flags and fireworks is the traditional thing to do on the day. But for us Aussies, deep in winter’s grip, it’s an indoor event with an Aussie twist - family and friends gettin’ down in our onesies and ugg boots. 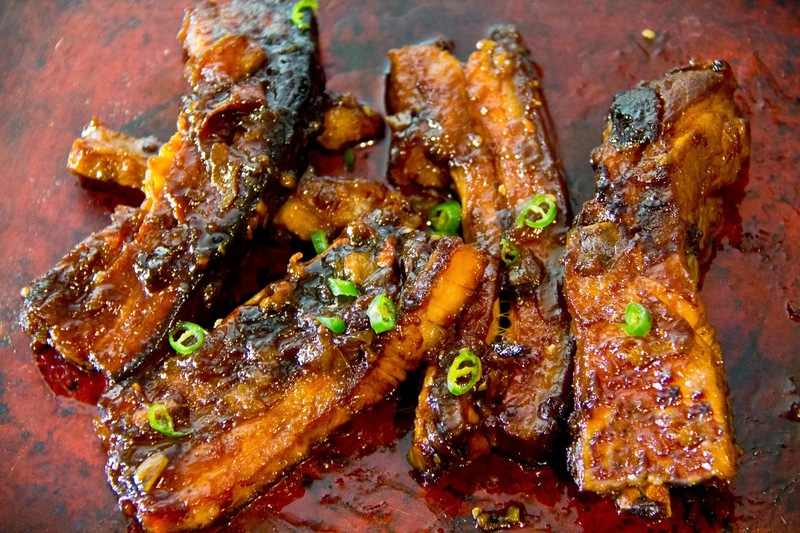 While I’ve stuck with the basic elements of a typical Independence Day menu, I’ve removed the “traditional” from these All-American pork, pumpkin and slaw recipes by deleting the cane sugar content and replacing it with Rice Malt Syrup. Rice Malt Syrup is a fructose and (mostly) glucose free sugar alternative. This conversion is not without its controversy, and may be considered as unpatriotic, given the Americans love of all things sweet. However, at the risk of water-boarding for my un-American activities, I plough on. On a recent and gradual campaign to better health, I have actively reduced our family’s sugar intake. For a few years now, I have found that halving the quantity of sugar in recipes rarely makes any difference to the result and allows other flavours to shine through. In recipes where cane sugar is completely deleted, it is replaced with a healthier alternative such as natural Rice Malt Syrup or stevia powder. There’s enough hype and publicity floating around about our ever-expanding waistlines, so I won’t bang on about the merits of fructose and glucose free food. If you still prefer to use the white stuff, the quantities are included in the following recipes. To obtain the equivalent sweetness in foods, the approximate ratio of Rice Malt Syrup to sugar is about half, and look for brands that contain no added sugars. Alert: stevia is a few hundred times sweeter than sugar, so use it sparingly. Rice Malt Syrup and stevia powder are available from supermarkets and health food stores. 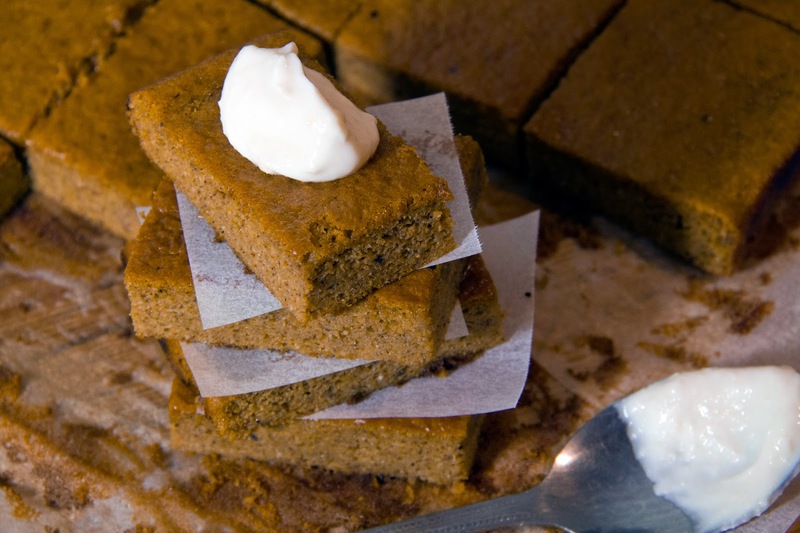 The pumpkin puree needed for the Pumpkin Pie Slice can be made ahead of time by placing a whole pumpkin on a tray in a 180C oven for one and half hours or until a knife can be inserted easily through the skin. When done remove the pumpkin from the oven and allow to cool a little before slicing and discarding the mushy core and seeds. Scrape out the cooked pumpkin flesh and place into a food processor bowl or use a stick blender and puree until smooth. Pumpkin puree can be frozen for a month or so in useable quantities sealed in ziplock bags. Almond butter can be made at home by processing whole almonds to a paste in a food processor or Thermomix. Alternatively, you can buy it ready made from the supermarket or health food store, but it can be a little expensive. Preheat the oven to 180C. Pour the rice malt syrup into a large lidded stovetop and oven-proof casserole or dutch oven. Cook on the stovetop over a medium heat, stirring occasionally, until the syrup is bubbling and toffee like. This will take about five minutes. Take off the heat and stir the beer in slowly. The mixture will bubble up, so do this at the sink. Allowing the mixture to cool down a little stir in all the remaining ingredients, adding the ribs in last. Return to the heat until the sauce starts to bubble. Turn the ribs over a couple of times in the sauce to coat. Place the lid on and bake in the oven for one and half hours, until the ribs are falling-off-the-bone tender. Stir a couple of times during baking to ensure that the sauce is not burning. If there is a lot of liquid remaining, and you prefer a drier consistency, remove the lid from the pot and bake for another fifteen to twenty minutes or so to reduce the liquid. Skim any visible fat from the surface and serve with crunchy cabbage slaw. Combine the cabbages, carrots, avocado, snow peas and half of the herbs in a large bowl. Whisk together all the ingredients for the dressing in a small jug, adding more water to thin if needed. 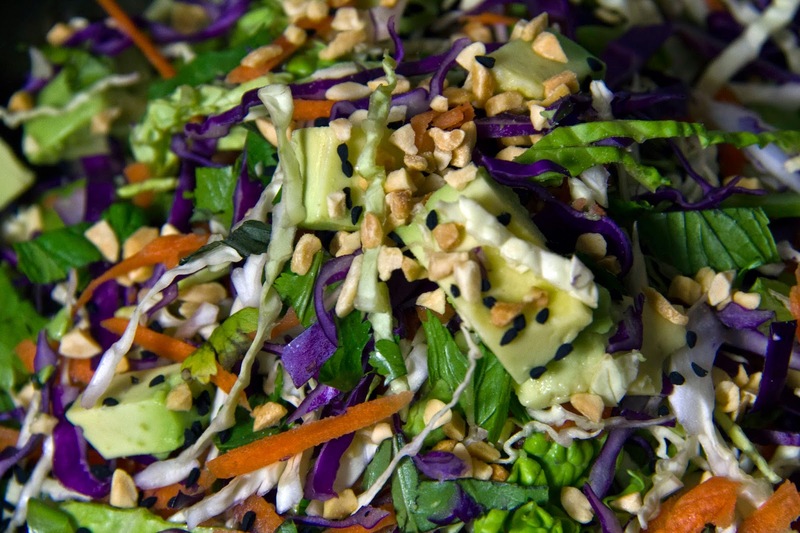 Toss the cabbage mixture with the peanut sauce and top with the reserved herbs, the peanuts and sesame seeds. Preheat the oven to 180C. Grease and line a slice tin approximately 30cm by 20cm. Place all slice ingredients in an electric mixer, beat on medium speed until combined, approximately two to three minutes. Pour into prepared tin and bake for twenty minutes or until a skewer comes out clean. When cool top with cream cheese frosting, and slice with a wet knife. In a food processor or stick blender, blend the cream cheese and butter until smooth. Add the remaining ingredients and blend. The frosting will set a little harder in the fridge if needed.